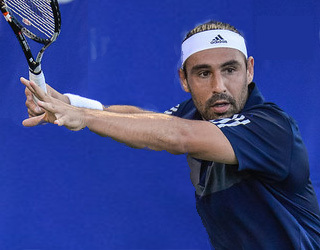 Marcos Baghdatis of Cyprus, above, winner of the 2009 event, beat Farrukh Dustov of Uzbekistan in straight set, 7-6, 6-3 to take the Men's Singles title on Sunday, August 3, at Hollyburn Country Club. Next up for Marcos is another ATP Challenger event in Aptos, California, and the US Open in a couple of weeks. There were no Canadians on the men's side of the main draw, doubles or singles, and in the women's singles, this year. The tournament offered North Vancouver's Felip Peliwo a wild-card entry, but Felip decided to play an ATP event in Washington, D.C., instead. Photo 1: Six-foot-five hard-serving Farrukh Dustov. Photo 2: Jermila Gajdosova, a Slovakian who now calls Australia home, topped Lesia Tsurenko of the Ukraine in a thriller, 3-6, 6-2, 7-6, for the Women's Single crown. Photo 3: The 25-year-old Ukrainian, Lesia Tsurenko, eliminated top seed Timea Babos, a Wimbledon doubles finalist, 6-3, 6-1 in the quarter-final. Photo 4: In the men's doubles final, the top-seeded American Austin Krajicek, left, and his Aussie partner John-Patrick Smith took out the New Zealand duo of Marcus Daiell and Artem Sitak, 6-3, 4-6, 10-8. Photo 5: In the women's doubles final, Maria Sanchez, left, and Asia Muhammad, seeded third, beat fellow Americans Allie Will and Jamie Loeb 6-3, 1-6, 10-8. Photo 6: South African Rik De Voest, winner of the 2006 event, with his wife, Carolyn, and son Morgan. Rik announced his retirement after he lost his second round match 6-4, 6-7, 6-4 to young Australian Thanasi Kokkinakis. Photo 7: British number two James Ward and winner of the 2011 event lost in the semis to Farrukh Dustov of Uzbekistan, 7-6, 6-3.